Back in April of 2014 I wrote a short non-fiction piece for the Robison Wells benefit anthology, ALTERED PERCEPTIONS. Rob has graciously given me permission to make that story available at no charge to you. The link below will let you download a ZIP file that contains ebook versions of the story. You can also click on the cover art. But that doesn’t help me think clearly. Knowing I’m not in my right mind doesn’t put me back in my right mind any more than knowing I’m barefoot pulls a splinter out of my foot. I’m standing in the middle of our kitchen, and I’m hungry, but I’m unable to solve the problem. Behind me the open pantry offers dozens of tantalizing options, but that’s not what I’m able to see. Each package, bottle, or bag looks like a closed door, an opportunity to eat something tasty, but only if I can get past the insurmountable obstacles between me and a meal. She’s in the dinette, across the counter from me. She loves me and understands me and wants to help, and right now she’s telling me that I’m not good enough to feed myself unless I take a pill. I’m lying, but that’s okay because I’m lying to both of us. Equal-opportunity deception. And I’m a good liar because in the moment I say those words I’m convinced that the problem is not me, my brain, or the absence of some neurochemical whose name I can’t pronounce. No, the problem is clearly external. There are several plates, a couple of glasses, a greasy cutting-board, and other kitchen clutter on the counter, but I can’t enumerate those things, can’t count them. They’re a frustratingly indecipherable puzzle, a tangled knot with no loose end of the string that I can take hold of in order to pull. The right-hand sink is about half full of dishes, stacked with a haphazard inefficiency that I find infuriating the more I stare at it. The kitchen window, above and behind the dish-pile, frames a beautiful, spring afternoon. Trees are just starting to bud, the distant mountains are still capped with snow, and we should have planted some snap-peas last week. My youngest loves snap-peas. I want to cry when I realize that there’s no way he’s getting garden-fresh snap-peas this year. But I don’t berate myself for that. She’s the one who knows how the garden works, and she’s not out there planting peas. She’s staring at me over the top of her book, but she looks away when I look at her. More infuriation. It roils. I want to lash out, because she’s reading a book instead of planting peas. My brain is not working correctly. Thank God for that sliver of thought, the voice of that lone spectator way up in the nosebleed seats where he can see the whole field. He knows that no matter how angry I may think I am with her, I’m really only angry at myself, even though I can’t seem to figure out why. “I know whose dish-day it is,” I snap. I don’t want a child in here with me. It would be too crowded. The kitchen is too small, and too cluttered, and just the thought makes it too crowded in my head, and I suppose I could leave the kitchen while somebody did the dishes but I’m hungry NOW. She doesn’t say anything. She feels guilty sometimes, guilty that she’s not a good enough Mom to have the kids trained to clean up the house, or even really clean up after themselves. It’s a place where she hurts sometimes, and I poked her right in that spot. On purpose. I’m not angry with her. I’m angry at me. The fury roils, and I want to slam something, throw something, break something, because just now I hurt somebody else on purpose and there should be punishment, but I’m afraid to deliberately hurt myself because the moment I do that I really have given up any hope of being independent. A twenty. Twenty milligrams of methylphenidate. It’s an ADHD medication, but she and I and my psychiatrist have discovered that under certain circumstances it’s exactly what my brain needs when it hits this particular failure mode. I’m not sad about the snap-peas. The boy likes the vegetables we can buy at the store. He doesn’t need to put garden-fresh peas in his mouth in order to be happy. But I need to put a pill in my mouth in order to not want to cry right now about how I need to put a pill in my mouth. I grind my teeth some more. I’m angry, I’m sad, I’m hungry, I’m miserable, and the only solution I can see is the one that feels like failure, the one where I do something somebody else tells me to do and take medicine somebody else prepared and which I’m only allowed to have under the direction of yet another somebody else, a nice lady who charges me $90 every three months just so I can tell her that yes, the pills I take still seem to work and though I should very much like to keep taking them I don’t want to take them, I don’t want to need them, I don’t want this dependency, and no, I don’t want to be crippled every few days, and we talk some more and at the end of the visit I have more prescriptions, more permits for these medicines I hate to want. The high cupboard where we keep the family pharmacy is literally one step from where I’ve been standing, paralyzed by indecision, anger, and depression. “Family pharmacy” is our little joke. There are a lot of bottles up there. Her medications, including the one she’s been taking for fifteen years ever since radiation treatment. My allergy medications, which I’ve been taking for almost twenty years ever since the allergist identified the dozens of varieties of plant whose pollen, duff, and assorted detritus sicken me for three months out of the year. The over-the-counter pain killers that alleviate our cold symptoms, suppress a nasty cough, or shut down a migraine headache. Three steps, really, because I sort of shuffle over to that cupboard. The prescription is in a translucent amber bottle with a white lid, and we’ve got several of those in the house at any given time, so I read the label and then peer up through the bottom of the bottle at the small pile of round, white tablets, each no more than an eighth of an inch in diameter. How can something so small seem so big? I open the bottle and gently shake a pill into my hand. With the deftness of more practice than I’d care to admit I fold one finger over the pill, pressing it to my palm, while the rest of my fingers cap the bottle. I take the pill, swallowing it dry because there should be unpleasantness associated with this, and then I take a glass of water anyway because that was a little more unpleasant than I remembered it being. “I hope so too,” she says. She’s closed her book and is looking at me intently, her eyes a little wet, and I hope that’s not because I poked her but if it’s not that then it’s because she’s sad for me and I don’t want that either. I feel beaten. Beaten in such a way that maybe I should be angry about it, but if I’m going to be angry at anyone in this house right now it should probably be all these filthy dishes in between me and the space I need to prepare food. I should probably scrape them off into the sink. They hate that. They want to stay dirty, so I should punish them by making them clean. It’s a mechanical task, and I think I can wrap my head around it. I open the dishwasher and begin. The moment I start pulling dishes toward the sink for their punitive scraping, she sets her book in one corner of the counter and quickly sorts some of the other clutter out of my way. We’re working on opposite sides of this ravaged, Formica battlefield, but we’re on the same side, and I know that, and that makes me want to cry but I don’t because my hands are soapy and if I even rub my nose I’ll be miserable in a way this pill I took won’t fix. Soon the dishwasher is full, the sink is empty, and the counter before me offers a clear expanse upon which to work, a blank canvas as my art-brain might suggest but I won’t be applying food directly to the canvas because this counter still isn’t clean enough to eat off of. Good enough for food prep, though, and if that seems a little counter-intuitive (ha-ha a pun) then you’ve never had street tacos. Oh. We’ve got uncooked tortillas in the fridge. And cheese. And I bet that bottle of assorted pepper flakes in the cupboard would work to season a queso fundido, which is really pretty easy to make, but I always make too much, but that’s okay because she likes it too, and we can share. “Have you eaten?” I ask. I do need help sometimes, but not right now. “No. 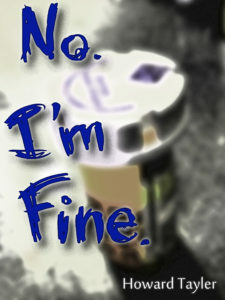 I’m Fine.” is a work of creative non-fiction. These events really happened, and I’ve taken pains to describe them in a way that may help others share in the experience of my mental illness. It was written in one sitting on Tuesday, April 8th, 2014 in Moab, Utah. It was kind of grueling to write. I felt great when I started. I was an emotional wreck when I finished. I suppose writing about it meant re-living it in some way. My own mental illness is quite mild compared to the ailments suffered by many others, including a number of my friends. It is my hope that this story will help remove some of the stigma associated with mental illness, and elevate our dialog about these issues. “No. I’m Fine.” was originally written for ALTERED PERCEPTIONS, a benefit anthology for my friend Robison Wells. He has generously allowed me to share it with you free of charge. You may re-share it freely, but please do not edit it or add to it in any way, nor remove this notice. 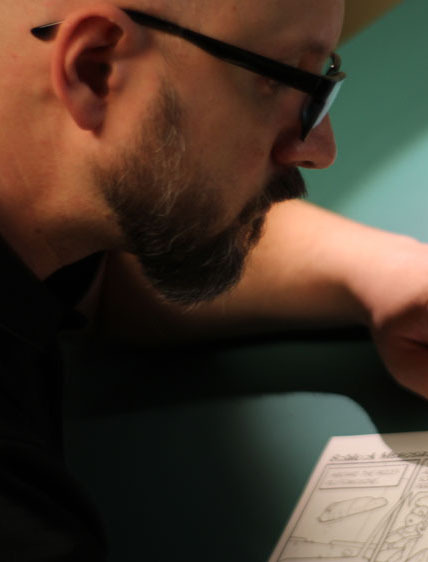 Additional formats may be found at https://howardtayler.com/no-im-fine, and any updates to the document or this notice will be reflected in the latest version there. Please direct any additional questions to schlockmercenary@gmail.com. Created cover art… and then couldn’t figure out how to embed it in the files. This was the version sent out for testing.